Creative Studies students from UBC’s Okanagan campus created and toured a collaboratively created devised performance, called ‘SQUARE/CIRCLE’. This was presented at the 19th annual Director’s Theatre Festival hosted by the University of the Fraser Valley Theatre Department, as well as at UBC’s Okanagan campus performance studio. This project was made possible primarily by the Tuum Est Student Initiative Fund, it was also sponsored by the Faculty of Creative and Critical Studies, the Eco Art Incubator research initiative, and the University of the Fraser Valley Student Union Society. Sit at the lunch table of our technology driven age, in a silent school cafeteria top full of LED glowing, texting, young-adult-zombies. Using abstract dance based movement and new media technology, this devised interactive performance experience brings its audience to public school in the 21st century. Through this piece, we ask our audience to consider what is at stake if we continue down our path towards a completely un-embodied, un-natured, disconnected educational system. This piece has been created by Shimshon Obadia in collaboration with fellow Interdisciplinary Performance program students Emily MacMillen, Shangning Zhu, & Melisa Hernandez-Paccagnella. This piece was created with mentorship from UBC Interdisciplinary Performance professor, Denise Kenney. 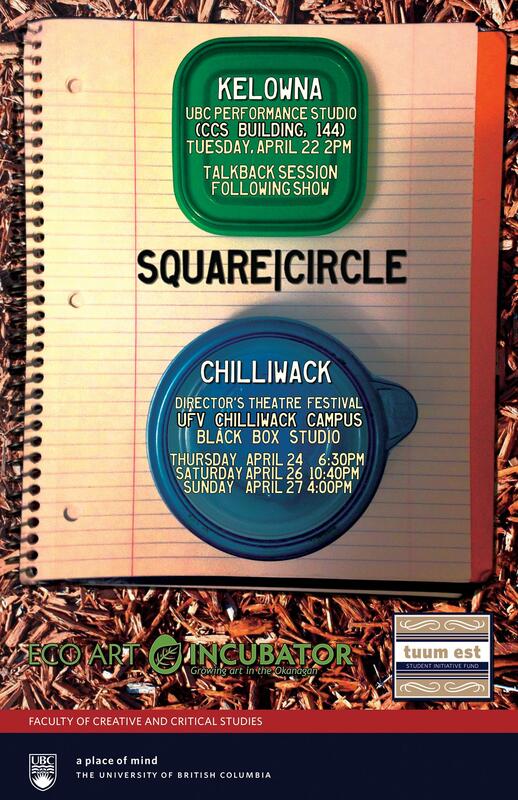 While attending the Director’s Theatre Festival, ‘SQUARE/CIRCLE’ was featured on local TV station, Shaw TV Chilliwack. As well, this being the third year UBC’s Okanagan campus has sent a submission to British Columbia’s largest inter-university play festival, the students and UBC were given a special mention in the festival’s opening ceremonies for bringing new and interesting creative pieces each year. Also, see more from Emily MacMillen at www.EmilyMacMillen.com. – Ian Fenwick, Festival Curator. – Jaide Ashcroft, Festival patron. – Danielle Warmenhoven, Theatre Student Association V.P. External. – Mike Metcalf, Festival patron. – Cheyenne Douglas-Ruttan,Theatre Students Association Treasurer.